When you pay for a product or service yourself, as an NDIS participant, or through your state or territory's disability support system - you have consumer rights. These resources from Australia's consumer protection agencies are designed to help you understand and use your rights. Under the Australian Consumer Law, you have rights when buying products or services, whether you buy something in-store, online, at home or over the telephone. the right to a repair, replacement or refund if something goes wrong. services (e.g. accommodation, cleaning, cooking, personal care, gardening services or case management supports). Australia's consumer protection agencies have produced a range of educational materials to help you understand your consumer rights and to help you use these rights if something you pay for isn't right. 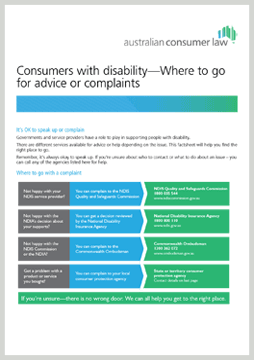 This factsheet is for consumers with disability and their carers and support networks. It will help you find the right place to go if you need advice or have a complaint. This guide is for consumers with disability and their carers and support networks. It is designed to help you understand and use the rights that the law gives you as a consumer. It includes a complaint letter template and a services cancellation notice template. 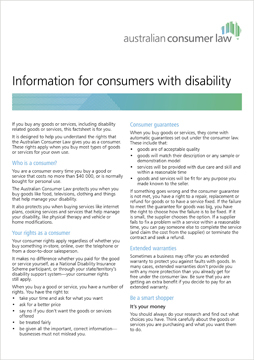 This factsheet is for consumers with disability. 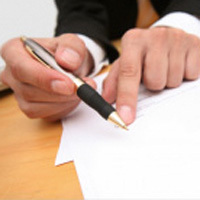 It provides a short summary of your consumer rights and the steps you can take to resolve problems. This guide is written in Easy English. It is designed for people who have difficulty reading and understanding written information. It explains your rights when you buy something and tells you where to go for help. For information about choosing a provider and making a service agreement using NDIS funding visit the NDIS website. An animated video in Easy English that is clear and easy to understand. It has been prepared with the assistance of consumers with disability. This animated video aims to help consumers with disability make informed purchasing decisions and understand consumer rights under the Australian Consumer Law. A DVD is available that contains both short videos (with accessibility options). To order a copy of the DVD, please email Publications.Unit@accc.gov.au. In addition to the above resources, PowerPoint presentations are available to facilitate a discussion about the Australian Consumer Law for both consumers and service providers in the disability sector. These presentations may be adapted to suit your organisation. To receive a copy of the presentations please email Publications.Unit@accc.gov.au. For more information about your consumer rights, contact your local consumer protection agency or speak to someone you trust. disability or health services complaint body.